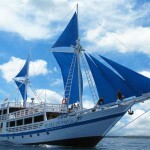 Cruise the glistening waters with a chilled drink in hand as you take in the stunning surrounds of Bali in style! The Burjuman is a glamorous 56 foot fly bridge triple-deck Italian yacht. This magnificent Italian crafted vessel is like having your own luxury apartment on the water. She provides ample room to relax in the sun or shade over her 3 decks. The Adelaar is a perfect choice for the intrepid diver seeking a luxury liveaboard experience or for a small group of friends looking for a customized itinerary. 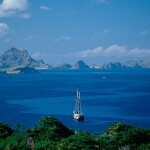 Comfortably accommodating up to 8 guests, the Adelaar offers signature fixed departure trips for 10 nights/11 days from Bali to the emerald isles of Komodo. 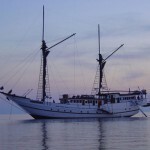 The Tambora is a 42 meter wooden Phinisi-style live-aboard that is characterized by comfort and space. 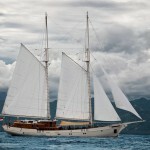 A 42m wood hull traditional Phinisi boat, 8 double cabins comfortably accommodate up to 16 guests. She proves that sailing and cruising on a traditional, beautiful wooden schooner does not mean compromises in terms of creaturely comforts. Tambora offers all luxury and amenities that you can imagine. The Silolona is a stunning and powerful phinisi yacht hand. She is a crafted traditional wooden sailing vessel built from the finest tropical hardwoods by the master Konjo Boat Builders of Sulawesi. 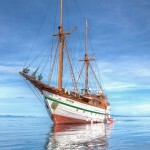 This magnificent wooden schooner melds the best of the traditional Spice Island sailing vessels with all the modern amenities one would expect in a vessel of her quality and size. Built by the Konjo Boat Builders boatyard, Si Datu Bua has been handcrafted from carefully selected raw materials and the result is a vessel that not only reflects the cultural heritage and boat building traditions of Sulawesi but one that also embodies the true essence and spirit of Indonesia. The Samata – Sanskrit for harmony, balance and tranquility – offers exclusivity, privacy and cruising flexibility to her guests. Guests can indulge in an array of exclusive services and prestige amenities on board whilst exploring the spectacular land and seascapes framed by dramatic and unforgettable sunrises and sunsets. The Salila is an expedition yacht that was built to explore and discover the seas of Indonesia but has since been redesigned for private charters so that you too can now share in Indonesia’s breathtakingly beautiful archipelago and discover your own piece of paradise. Reveal the natural marine richness of Raja Ampat right at your doorstep with Pearl of Papua and explore spectacular diving sites around the archipelago. Fully equipped with modern conveniences and staffed with experienced and professional crew, the Pearl of Papua offers liveaboard charters with departures all year round to the pristine Raja Ampat islands in the heart of the Coral Triangle. 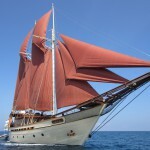 Ondina the classic Buginese schooner is built entirely of teak and tropical wood to create a comfortable accommodation to be your home and base camp as she sails and dives from island to island. Since July 2001, Ondina has traveled year round moving with the seasons in order to visit the best diving spots Indonesia has to offer at the right times e.g. 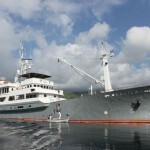 : Komodo, Raja Ampat, Triton Bay, Lembeh Strait, Wakatobi, Gorontalo, Ambon. 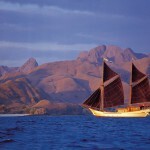 When you see the Mutiara Laut double mast schooner in full sail, it is hard not to recall romantic oceanic adventures of the past. The Mutiara Laut (meaning ‘Pearl of the Sea’ in Indonesian) has been carefully and lovingly constructed to cater to every sea-faring fantasy.